Here’s a plan of Wolverton Works and the northern Streets circa 1850. I’ve cleaned it up a bit. The quadrangular building in the centre is the first Engine shed and the main reason for Wolverton’s being. On the right is the new Engine Shed built about 1845. This is what it looked like from the bridge in the 1960s. The three short streets of cottages to the north are (from the east) Garnett Street, Cooke Street and Walker Street. They had a very short life. They were cheaply built with one room downstairs, and a scullery with a sleeping platform above and although they were cheap to rent they were generally unpopular. When the time came for workshop expansion in the mid 1850s they were unceremoniously levelled. The long street on the eastern side, Bury Street, had about 40 houses and shops. There were 8 shop units at the north end and 6 larger, 3 storey houses at the south end, rather like the house preserved on the corner of Spencer Street in New Bradwell. Starting in the mid 1850s, these house sites were gradually reclaimed for industrial purposes and by the 1890s only one house, for many years a drapery, was left standing at the south end. The fourth street in this section, on the south side of the Engine Shed, was known as Gas Street, after the gas Works that were originally on this street. These gas works were relocated to the east of the second station in the 1840s and in 1881 to the old Wolverton Road. The buildings for these gas works are still there, although in a somewhat derelict state. There were 8 house units on this street of better quality than many of the other early builds and they lasted until the 1890s. 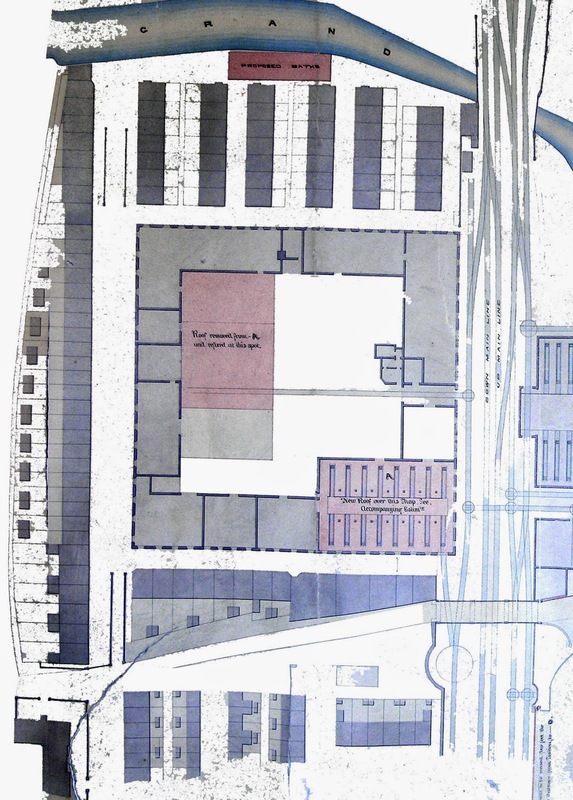 Another point of interest on this plan is the first bath house at the north end beside the canal. This moved to the south end of Ledsam Street after 1856 and to the Stratford Road in the 1890s. Just to the south of the stratford Road you can see the school building on the west side, the beginnings of Creed, Ledsam Streets and Glyn Square. The isolated rectangle, just to the north of the Gyln Square terrace, was the first Market House. This was used regularly from the 1840s until it was damaged by fire in 1906.